Hear a live update from Executive Director Emmett Reed on our long term care priorities - budget, tort reform, regulatory - along with member interviews. Conferencing has begun on the budget and the House has taken a position of cutting nursing home Medicaid funding by 8.5% ($245 million). We need your immediate assistance with contacting key legislators in the budget decision-making process and asking them to reduce these nursing home funding cuts. Cuts of this magnitude would result in facilities losing $377,831 annually, or $15.78 per patient day. These cuts threaten the financial viability of our state's nursing homes and more importantly, resident quality care and vital caregiver jobs. Send an email to key legislators. You can use our Take Action link and email the message we've provided or write your own. Consider including the specific impact your facility will see from an 8.5% funding cut - click here for a detailed link with that information. Forward the Take Action link to your staff and family members to help us increase their knowledge of the funding cuts at stake this session. Post the alert on your Facebook page to perpetuate this message across your social media networks. We've made it simple -click here to post an update for your Facebook friends to see your call to action. Tweet the message to your followers. You can click here and the message is ready for you to send. Please take action today! Time is of the essence, as the budget will be finalized in the next few days. Thank you for helping us increase the number of voices speaking up for long term care. The Florida Health Care Association commended the appointment of Jim Crochet as the Director of the Florida Long Term Care Ombudsman Program, citing his years’ of experience working with Florida’s long term care community and his understanding of the care needs of our state’s most vulnerable seniors. Hear an update on progress of several regulatory bills we're tracking, as well as an interview with Rep. Ken Roberson, R-Port Charlotte and Brynwood Center of Monticello CNAs. HB 119 by Rep. Matt Hudson (R-101), which contains important nursing home deregulations, passed its last committee of reference and is now available for the House floor calendar. As one of the few health care bills moving this session, we are very watchful that it does not become a vehicle for last minute amendments. The companion bill, SB 1736 by Sen. Jack Latvala (R-16), will be heard in its last committee, Senate Budget, on Tuesday. HB 311 by Rep. Ken Roberson (R-71) also passed its last committee Thursday and is available for the House floor. This good bill eliminates municipalities' ability to impose an occupational licensure tax on certain employees, including your CNAs, working within business entities already paying the tax. Be sure to watch this week's Provider Program video update to catch an interview with Rep. Roberson on this important issue. Hear an update on nursing home tort reform, FHCA Executive Director Emmett Reed interview with Sen. Thad Altman and Opis Management Resources employees' legislative experiences. Bipartisan legislation introduced in both Houses of Congress today would remedy the complex and confusing process resulting from observation status during a hospital stay. Introduced by Senators John Kerry (D-MA) and Olympia Snowe (R-ME) along with Representatives Joe Courtney (D-CT) and Tom Latham (R-IA), the Improving Access to Medicare Coverage Act of 2011 would rectify a confusing status that leaves seniors in a limbo land of healthcare delivery. The bill ensures that time spent under observation status in a hospital to count toward satisfying the 3-day inpatient hospital requirement for coverage of skilled nursing facility services under Medicare. Often patients are kept much longer than the prescribed limit for observation stays and are not informed of their admission status. In fact, from 2007-2009 the number of patients spending four or more days under observation status doubled. Patients who need to enter a skilled nursing facility following an observation stay face the possibility that their care in the facility will not be covered by Medicare Part A because of the lack of hospital classification as an inpatient. This can result in patient confusion and the possibility of not receiving appropriate and necessary skilled nursing care. In some instances, patients arrive at a nursing facility, and because Medicare will not cover the benefit they are forced to pay out-of-pocket. Over 75 long term care employees from Opis Management Resources, which operates 11 skilled nursing facilities in Florida, are meeting with their local legislators today to talk about the impact Medicaid funding cuts would have on caregiver jobs and resident quality care/quality of life. Nearly 50 percent of nursing home costs pay for legislatively-mandated direct care staffing, with Florida having one of the highest staffing ratios in the country. Those staffing mandates have resulted in the hiring of over 11,000 new nurses and Certified Nursing Assistants, and today, Florida’s nursing homes employ nearly 259,000 direct- and indirect-care workers. The proposed Medicaid funding cuts ($202 million in the House; $144 million in the Senate), however, would essentially eliminate an amount equal to the annual funding provided for the increased staffing mandates created 10 years ago through the passage of landmark elder care reform. 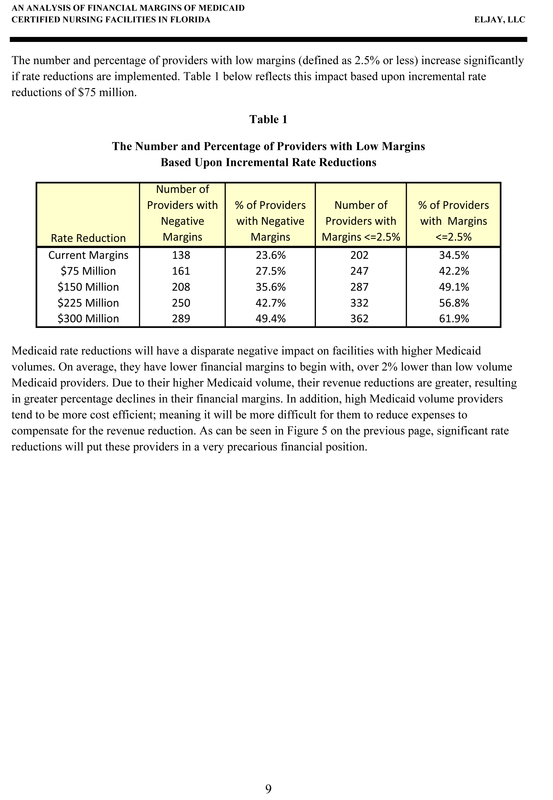 A study conducted by researcher Eljay, LLC, projects that under the Legislature’s proposed cuts to Medicaid nursing home funding, over one-third of Florida’s facilities would experience negative margins, and nearly 50 percent of all facilities would have margins of less than 2.5 percent. A recent report by the Florida Health Care Association indicates that some facilities would lose as much as $1.2 million if the proposed budget cuts go into effect. Facilities which are already operating at a deficit when it comes to Medicaid residents will have no ability to recoup from these significant reductions, putting quality care for residents and vital caregiver jobs at risk. Over 400 long term care professionals have traveled to Tallahassee over the course of the 2011 legislative session to take part in FHCA’s Lobby Wednesdays. Opis skilled nursing facilities represented as part of this week’s grassroots initiative included Bayview Center and Ruleme Center (Eustis), Bridgeview Center and Coquina Center (Ormond Beach), Fairway Oaks Center (Tampa), Highlands Lake Center (Lakeland), Indian River Center (West Melbourne), Island Lake Center (Longwood), Riverwood Center (Jacksonville) and Tierra Pines Center (Largo). Fresh off the heels of a New England Journal of Medicine study that shows litigation, or the threat of litigation, doesn't lead to improvements in patient care, the Florida Health Care Association today praised Sen. Rene Garcia (R-40), Chairman of the Senate Health Regulation Committee, and Sen. Ellyn Bodganoff (R-25), sponsor, for their leadership in moving forward on the Nursing Home Litigation Reform bill (SB 1396). Prior to the passage of landmark elder care reform in 2001 (SB 1202), a torrent of litigation was draining precious taxpayer resources, demoralizing staff, pitting families against staff and increasing costs. SB 1202 mandated nursing home staffing increases and implemented tougher regulations, mandatory risk management and quality improvement programs, which together have resulted in quality care improvements in Florida’s nursing homes, which today have among the highest staffing ratios in the country. Nursing Home Litigation Reform will eliminate loopholes in that law to artificially inflate the costs of defending litigation and the value of claims brought against nursing homes by predatory trial attorneys. Long term care staff and family members meet with lawmakers to discuss important LTC issues, including the quality care Florida's nursing homes deliver. The Senate Budget Subcommittee on Finance & Tax voted this week to advance SB 582 by Sen. Nancy Detert (R-23), an important bill FHCA has been working on this session. The bill will exempt certain employees working for business entities, like your CNAs, from being inappropriately taxed under certain municipalities' occupational tax requirements for licensed professionals. The House Health and Human Services Committee discussed a proposed committee bill on background screening on Wednesday. The PCB was the substance of SB 1992, which fixes a problem created last year with screenings related to the volunteers who deliver Meals on Wheels. The committee adopted an amendment at FHCA’s request to allow CNA applicants to use previous background screening reports if done within the past 90 days. Peggy Rigsby of our staff testified in support of this amendment and three other issues related to background screening that we are working to fix on members' behalf. The House companion just received a number, HB 7233, and has been referred to the House Judiciary Committee. We'll keep you updated as progress on these important bills continue. Hear from FHCA Executive Director Emmett Reed on important bills related to nursing home tort reform. FHCA President Nina Willingham and Lobby Wednesday sponsor Ponce De Leon Risk Retention Group speak about the importance of this grassroots initiative. Citing the importance of preserving precious Medicaid dollars used for nursing home resident quality care, the Florida Health Care Association today praised Representative Eric Eisnaugle(R-40), Chairman of the House Civil Justice Subcommittee, and Reps. Matt Gaetz (R-4) and Shawn Harrison (R-60), sponsors, for their leadership in moving forward on the Nursing Home Litigation Reform bill (HB 661). Prior to the passage of landmark elder care reform in 2001 (SB 1202), torrent litigation was draining precious taxpayer resources, demoralizing staff, pitting families against staff and increasing costs. SB 1202 mandated nursing home staffing increases and implemented tougher regulations, mandatory risk management and quality improvement programs, which together have resulted in quality care improvements in Florida’s nursing homes, which today have among the highest staffing ratios in the country. Nursing Home Litigation Reform will eliminate loopholes in that law to artificially inflate the costs of defending litigation and the value of claims brought against nursing homes by predatory trial attorneys.